Swallows Nest sleeps 4 - 6 and has underfloor heating throughout. There is a large en-suite bathroom next to the main king size double bedroom with a bath and shower. Twin beds in the mezzanine bedroom. Double sofa bed in living room. Travel cot and moveable single put up bed. Large wood burner, oak floors and handmade oak staircase. A large family kitchen and dining table with range cooker and large garden. We accept well behaved pets. Washing machine, microwave, DVD and free WIFI. Outside there is a large garden with BBQ and decking area. We live in St Davids and Ben my partner renovated Swallows Nest himself. He is a carpenter and green woodworker with his workshop near the barn so you can come and see him making stools and chairs. We renovated the barn and when we bought it in 2007 it was a cowshed with cows in it! It is now a luxury barn conversion with underfloor heating throughout and a large woodburner. Swallows Nest is at Tregydd farm a quite location just a mile and a half from St Davids. The farm is no longer a working farm but there are horses and chickens. Pembrokeshire is a fabulous area and we have lived here for about 15 years. The beaches are some of the cleanest and quietest in Britain and our local beach Whitesands is a blue flag beach and is great for families. Swallows Nest is in the Pembrokeshire Coast National Park and has some of the most beautiful walks in the country right on the doorstep. There is a large garden and we are happy to have visitors with dogs, please enquire if you would like to bring a dog. The underfloor heating is powered with a ground source heat pump, whilst our electricity is provided by Green Energy. We endeavour to use environmentally friendly cleaning / laundry / washing up products, making Swallows Nest an ethical choice for visitors. Ensuite bathroom with bath and shower and toilet. Also a toilet / sink off the kitchen, underfloor heating. We provide hand towels, bath matts and tea towels. Please bring your own bath towels. Double sofa bed and large sofa, TV, DVD, Freeview, WIFI, large wood burner, oak floors, underfloor heating. Large range cooker, fridge-freezer, washing machine, microwave, Belfast sink, underfloor heating. We have a decking area with table and chairs. Local St Davids golf course is 3 miles away, its a 9 hole links style course. Outside: Large garden with decking area and large lawn. BBQ Large wooden table. Utility Room: Ironing board, high chair. Hand towels, tea towels, all bedding supplied. Please bring bath towels. We had the most enjoyable, peaceful stay at Swallows Nest. Beautiful large property,it's the kind of place you can settle down and relax. Beautiful, cosy yet spacious cottage, with everything you need. 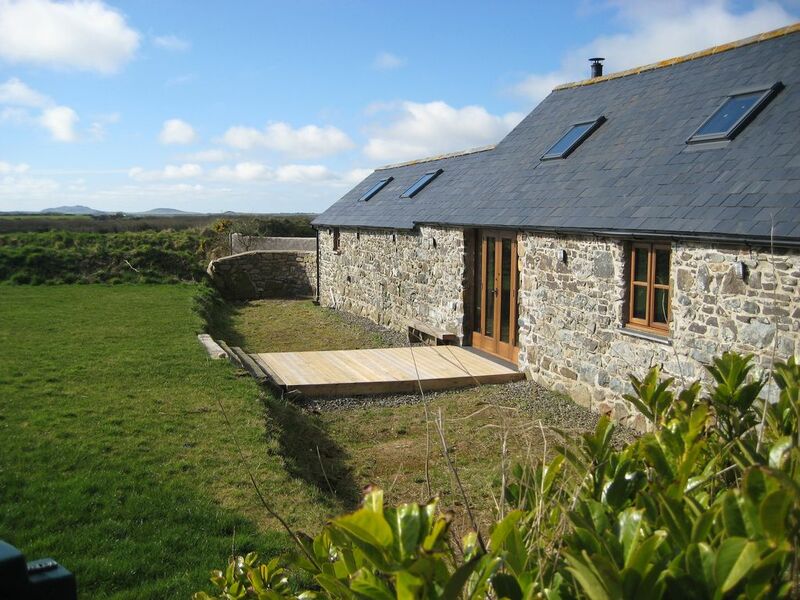 Fantastic location, just 4 miles from St Davids. Beautiful walks and beaches close by. Great for the family, and the dog! Very comfortable and well-equipped cottage, in a perfect location a few minutes' drive from St David's and several fantastic beaches. We went sea kayaking, surfing and coasteering, jumped 30ft off the side of a quarry into the sea, took a boat trip to see puffins and porpoise, and went on loads of beautiful cliff-top walks to isolated little beaches. Beautiful wild flowers, nice cafes and restaurants, very friendly and helpful owners, perfect holiday. Just be aware that the only shower and bath in the cottage are in the ensuite of the double bedroom, which might not be ideal for some groups. Shower is great. Wifi mostly good with occasional problems for an hour or two. Back garden not fully enclosed so dog can get round to the front - not ideal, and hopefully owners will sort that out, but it's a quiet place so wasn't a big problem for us. All in all, we had a brilliant time. Would thoroughly recommend. We had a fantastic time in 'Swallows Nest'. It is such a beautiful, tastefully decorated cottage with everything you need for your stay! The location is ideal for exploring St David's and the surrounding area. We were lucky enough to have great weather, which allowed us to sit outside and also enjoy the garden and the sky at night was breath-taking! So many clear stars to look at! We also had the company of a really friendly little cat! Anne, the owner couldn't have been anymore helpful; she was fantastic! Our only complaint is that we didn't stay long enough......but we are already planning our next visit! Perfect cottage, perfect location, perfect hosts!! Ian, Beth, Lily, John & Claire. Thank you so much Beth, it was a pleasure to have you stay with us and we would love to welcome you back again! We had a wonderful stay. Swallow's Nest was great - warm, cozy yet roomy, comfortable, clean, attractive, easy wifi, the kitchen well-equipped ... We liked it so much we stayed an extra day. Excellent location, wonderful hosts. Ben and Anne made us feel quite welcomed and they provided great suggestions for enjoying our time. We hope to go back and will most definitely recommend the cottage to friends and family. Excellent, really relaxed and welcoming, and warm. Very lovely barn and country feel. With just the 2 of us staying, the barn was plenty large enough for us, and a lovely touch to provide some milk and a welcoming cake too. Owners really helpful and communicative, Ben turned up to make sure we were OK and understood how it worked.We have kept the details, and have already recommended to relatives. We were fortunate to hit some lovely weather in October and sit outside to have breakfast, real treat. Highlight was probably having a fire and feeling very cosy on the Sunday evening. We enjoyed exploring Fishguard and found a really cool converted chapel that does lunch and drinks. The rib tour around Ramsay Island was a must, as well of course as the coastal paths. The barn is really close to St David's, and we found it easily the late the first evening.